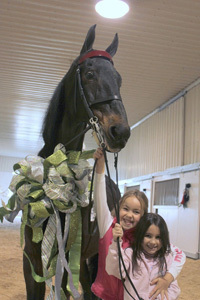 Previous owner, Cashlyn Lovell, is pictured here with Adrianna Peacock and "Fruitcake". Cash Lovell Stables' Annual Holiday Party had a turn-out of over 600 family and friends this year! A mechanical bull, country style breakfast, arts and crafts, dancing, games, and huge bouncy inflatables made it a festive time for everyone. At the end of the party, a very big surprise was presented to one of our young riders, Adrianna Peacock-- CH Holy Fruit Salad!